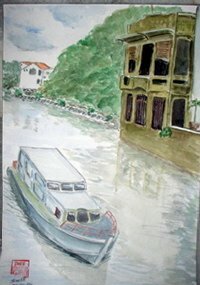 This was another painting done on the bridge overlooking the Malacca rivermouth. The green building at left is now a restaurant. The scenery is at high tide. The boat is actually a tourist boat which takes visitors on the Malacca river cruise for a small fee. This piece was done in May 2004.